March, 2018 | H&R Group K.K. Often referred to as Japan’s Hawaii, Okinawa is the primo vacation destination for Japanese, and with good reason. With beautiful beaches, stunning scenery, amazing food and friendly locals, there is so much to see and do, that anyone spending a length of time in Japan must find time to visit. Okinawa is a string of islands that start out off the coast of Kyushu and end up not far from Taiwan, and so many of them are wonderful places to visit. Each have a million and one different things to recommend them, and were I to list them all here you could be reading all day and night. As such, I have included below just personal recommendations. As such, keep in mind that much of this is based on personal opinion, and all tastes may not be catered for. Centered around it’s capital Naha, Okinawa Island (or Okinawa Honto) is the main destination for most tourists, which comes with its own pros and cons. The former, however, far outweigh the latter. While there are better beaches and seas on other islands, Okinawa Island is till home to some stunning places to swim and snorkel. Many of these are part of large hotel complexes, but Zampa Beach is great for sunning yourself, swimming, and beach games, and Sunset Beach, as the name suggests, is beautiful as the day draws to a close. Off the shores, perhaps the biggest draw to Okinawa Honto is Chuarumi Aquarium, considered to be the best in Japan, with its giant whale sharks and manta rays. Off the beaten track, explore the Iriomote Jungle with one of the amazing tours – from hikes to kayaking – the subtropical forests are amazing. For rest and recuperartion at the end of the day, Naha’s Kokusai-dori is lined by izakayas in which you can enjoy local delicacies while listening to Okinawan folk music. If you want to live dangerously, have a few swigs on the ‘habuzake’ snake rice wine, said to give you strength! If you’re looking for beaches, beaches, beaches, then Miyako Island is the place for you. Maehama Beach on the south west tip of Miyakojima frequently top lists of Japan’s best beaches, and not only is it an idyllic spot for sunbathing, swimming and general beach frivolities, it is also host to beautiful sunsets. Those with a passion for snorkeling will want to head to Yoshino Beach, where waters are crystal clear and schools of brightly colored fish dart around you. The coral reefs in which this sea life makes its home is vast and just a few paces from the shore. Fortunately if you don’t have your own gear then there is a rental store near the beach as well as showers and other facilities. Away from the beaches there are other attractions such as the Tropical Botanical Garden with over 1600 types of plants, the Cape Higashi-Hennazaki Lighthouse, and national cultural asset Tuyumya Grave that enshrines Nakasone Tuyumya, the leader of Miyako in the 16th century. Everyone that I have ever met who has been to Ishigaki Island just raves about it. Like, crazy. The main island of the Yaeyama Island grouping, Ishigakijima is a diver’s paradise. There are many tour companies on the island that can take you out to see some of Japan’s most amazing sea life in the cleanest of waters around some of the most beautiful islands. Ishigakijima isn’t just for divers though. From all of the beaches on the island you can swim, snorkel and just laze around. There are both white sandy beaches and those made up of bleached coral, all stunning and open year-round. Transport on the island is infrequent, so car hire is recommended in order to explore. A little west of Ishigaki Port on Yui Road is Torinji Temple, said to be the first Buddhist temple built on the Yaeyama Islands, and next to this is National Important Cultural Property, Gongendo Shrine. Along the coastal road is Tojin Baka, a brightly colored – almost jovial – Chinese memorial to a group of laborers who were drowned or murdered while being transported from Xiamen (Amoy) to the USA in 1852. This is another island that comes highly recommended from friends of mine, particularly as a beach resort. Zamamijima has long, white sandy beaches which are less than a 20 minute walk from the port, and crystal waters into which you can dip for swimming or snorkeling if the heat gets too high. If you want to get a little further into the ocean there are glass bottomed boats from which you can see all the varied sea life, and from January to March there are whale watching boat tours. For those who prefer a bit more seclusion, boat-taxis can take you to the nearby small uninhabited islands of Gahi and Agenashiku for swimming and sunbathing in relative peace. There are plenty of hotels on the island, but if you do a little research you can find B&Bs above the homes of local fishermen, where you will dine on the freshest of sashimi. For the more adventurous, beach camping is a recommended option, and for dining, Yapari Steak House near the port is a must, dishing up huge sizzling platters of beef with eat-as-much-as-you-like salad, rice and egg soup. This article is part of a Japan Info Swap series about traveling around Japan. Check out the others in the series here. Sooner or later as you become acclimated to this place, you’ll start learning about the different eras of Japan. For example as of March 2018, we are living in the Heisei Era, as defined by the sitting emperor. It’s how the year is officially calculated, and loosely defines a generation’s identity. The era preceding this one was the Showa Era, and was bookended by WWII and the Bubble Economy; roughly 1926~1989. Many Japanese look fondly on this era and if they lived in Tokyo during the middle of this period, they saw a massive transformation of living standards, the physical landscape and indeed the very meaning of what it means to be Japanese. Even if you only have a passing interest in this period of history, you should wander over to the Taito Shitamachi Museum to see first-hand what life was like during the period. The Taito Ward Historical Society runs the museum in a scenic corner of Ueno Park. The ward is itself one of the oldest in Tokyo and is called the heart of the shitamachi , or old downtown area of Tokyo. Inside, you will find dioramas of old shops and streets, that you can explore on your own or with a free English speaking volunteer guide. Even though I’ve been here a long time and know a thing or two about Japanese history, I still opted for the guided tour because you’ll always learn something new, and they readily answer any and all questions. The first floor gives a look at how daily life was in the tenements of Tokyo before WWII, the wooden 2 room row houses that shared a common roof. These homes often had 4 or more people people living in them, commonly used the front room as a storefront or workshop leaving only one room as a common living/dining/sleeping area. From the common well, to the outhouse, keeping good terms with one’s neighbors was key to life in the shitamachi, and is a trait that is still seen in modern Japan. The second floor houses examples of toys, games and books of the postwar era. There’s also a wonderful mockup of a living room and kitchen along with a reconstruction of the entrance to a public bath; taken from the actual building when it was torn down a few years ago. This along with many photos and movies of the time help transport you to a time before Tokyo was known for its Bladerunner-esque skyline and faster-than-lightspeed pace. JR and Tokyo Metro Ueno Station, Tokyo Metro Yushima stations are closest to the museum. Hours Tue-Sun, 9:30a-4:30p, Closed Mondays. Images: Taito Ward Shitamachi Museum, Jason L Gatewood, own work used with permission. Many of Japan’s most famous shrines and temples are in the old capital of Kyoto. Tokyo, while not as historic as the city it replaced as the nation’s social and economic base, still has plenty of beautiful and important shrines and temples – hundreds even. Below is a selection of our top recommendations. Completed in 1920, Meiji Shrine is one of the most popular shrines in the city. Built to commemorate the role he played in the restoration that also bears his name, this was once the resting place of Emperor Meiji (1852-1912) and his wife, Empress Shōken (1849-1914). The shrine is located next to Yoyogi Park, and it is renowned for both the 12m (40ft) torii gates (pictured) and the inner garden, which is thought to have been designed by the Emperor Meiji himself for the pleasure of the Empress. Said to be founded in 628, Sensoji is thought to be the oldest temple in Tokyo. Steeped in the feeling of the Old Tokyo area of Asakusa, it is a striking temple with a five story pagoda and bright red gates. It is believed that the Asakusa Kannon deity is enshrined there, and around 30 million people visit every year. It is also home to the Sanja Matsuri festivities in May. Yasukuni Shrine makes this list, not because of its beauty – although it is quite astounding and possesses one of the biggest torii gates in the country – but due to the interest surrounding its somewhat controversial nature. Established in 1869 by the Emperor Meiji, it is a shrine that both commemorates and houses the spirits, or ‘kami’ of Japan’s war dead, giving it a political significance similar to that of the Cenotaph in London. The controversy centers on some 1,068 combatants convicted of war crimes enshrined among the more than 2.5 million ‘kami’. Constructed in 1274, Tennoji temple is one of the last remaining refuges for the Tendai sect of Buddhism. It is set in picturesque lawns, and perhaps most amongst the city’s places of worship best displays the aesthetic ideal of Buddhism. At the edge of the temple sits the Tennoji Daibutsu, a large statue of Buddha that has survived despite much of the temple being destroyed during the civil war of 1868. Nezu Shrine was originally built about 1900 years ago in Sendagi, then later moved to Nezu with construction thought to have been completed in 1706. It is an excellent example of Edo Period shrine architecture, and is nestled among the 6,600sqm Tsutsuji-en Park grounds, featuring carp ponds and pathways that are tunnels of small shrine arches. Spring is the best season in which to visit when the roughly 3,000 azalea plants are in bloom. Like Yasukuni Shrine, Sengakuji Temple makes this list on grounds of cultural importance more than beauty. The temple itself is small and somewhat unremarkable. Its famous for being the cemetery of the 47 ronin (leaderless samurai) who avenged the death of their master, and were forced to commit seppuku (ritual suicide) following their actions. These 47 ronin, held up as the epitome of samurai bushido code of honour, have been popularized in Japanese culture throughout the centuries, and recently in the West thanks to the 47 Ronin movie starring Keanu Reeves. In much the same way as a church is not the same as a synagogue, shrines and temples are not interchangeable terms for the same thing. Shrines (‘jinja’ 神社) are places of worship for Japanese Shintoism, whereas a temple (‘otera’ お寺) is for Buddhism. For a more in-depth look into the differences and similarities, check out what The Japan Guy website has to say on the matter. Below is his simple break down. Of course you know what Tokyo’s Akihabara district is known for: electronics, video games, anime and manga shops, maid cafes, and anything else that would make a nerd, geek, weeaboo and “technojapanophile” drool. Since I fit into lots of these categories, I tend to visit the area once a month or so just to check the scene out. But there’s more to Akiba than all this. Theres something brewing out of the culture here that harkens back to the days of prewar Tokyo, and Akihabara wants to show everyone that side too. Typical in space-starved Tokyo, before something new can be built, something old must be torn down or moved. Back in 2010, JR East started a project to add additional tracks between Ueno and Tokyo stations to make the Tokaido Line transfers easier. At this same time, JR also decided to look into removing their equipment stored there and leasing more spaces underneath their elevated line near Akihabara station. From that newly reclaimed area, two new venues were created: Chabara Aki-Oka Marche was born. Yeah that is a long name to be sure. Chabara is a coined portmanteau that means fruit and veggie market of Akihabara. Aki-oka means between Akihabara and Okachimachi stations , and marche is French for market. Just shorten it to Chabara when asking for directions if you get lost, since no one really knows it by the long name. What’s important is that it is a market where local food, candies, snacks, drinks and more that have been collected from all over Japan can be found. Think of it as the ultimate souvenir shop for the distinguished Japan connoisseur in your life. Personally, I’ve lived in three different regions of the country: Kansai, Chubu and now Kanto. Each area I’ve lived in has something famous I can’t seem to find anywhere else, but places like Chabara specialize in making sure it’s there. Like the special Steakhouse Curry made with Hida Beef (which is a step above Kobe Beef IMHO). Previous to Chabara I could only find it either in that region of Gifu Prefecture or order it online. The same for the slightly spicy red miso paste I like from Aichi Prefecture. Also let’s not forget that other food-related pasttime many may have– looking for good libations to evoke their trip to someplace new. Chabara has you covered in the adult beverage category as well with oodles of wines, spirits and local beers to peruse. Can We Grab A Bite While We’re Here? There are 2 shops where you can catch a breather. Yanaka Coffee is a specialty coffeeshop that gets at least 30 varieties of beans direct from the growers. Grab a cup or take home a bag. Komakishokudo specializes in preparing food that is served in Buddhist temples here in Japan. That means absolutely no meat whatsoever is found in their cuisine. Whenever I have a vegan I’m helping navigate the city, this is one of the places I recommend. Head over to JR Akihabara station. Then it’s about one minute north out of the Electric Town exit. Images: Chabara Entrance, Chabara Interior. Jason L Gatewood, Own Work. If you find yourself in Hiroshima or the surrounding area for any length of time, you really should set aside a day or two to explore the Seto Inland Sea. It’s not uncommon for people to live in the city for years, within sight of the Inland Sea and its islands, and never do more than visit Miyajima. Of course, by all means, visit Miyajima, as often as you can! But just a couple of kilometers south of Miyajima’s crowded tourist district, the little fisherman’s island of Atata receives almost no visitors at all. There are many likely destinations on and around the Inland Sea. Let’s begin, though, with the Shimanami Kaido. What is the Shimanami Kaido? The Shimanami Kaido, also known as the Nishiseto Expressway, opened in in 1999. The 60 kilometer route leapfrogs island to island across the Seto Inland Sea by a series of bridges, beginning in Onomichi on Honshu and ending in Imabari on Shikoku. This not only affords direct access to the islands along the route, but gets you closer to ferry crossings to a number of surrounding islands. Since opening, the Shimanami Kaido has gained fame both in Japan and abroad as a cycling route, since the route was built to include cycling lanes that allow even casual cyclists to comfortably cross from Honshu to Shikoku in a single day. Two of the islands mentioned below can be accessed directly from the Shimanami Kaido, while the third is part of the same Geiyo Island chain and easily reached by ferry. The third island along the Shimanami Kaido traveling south from Onomichi, Ikuchijima would be a pleasant but thoroughly anonymous place were it not for Kanemoto Kozo, an eccentric Osaka businessman who loved his mother. To please her, he first built her the Choseikaku Villa as a holiday retreat. Upon her death, though, he began construction of Kosan-ji, a famously odd temple complex including replicas of famous religious structures around the country, including the iconic Yomeimon gate at Nikko Tosho-gu, a towering Kannon statue, garishly eerie depictions of hell in a series of artificial caverns, and an abstract sculpture park (Kanemoto was also a lover and noted collector of art) built with some 3,000 tons of Carrara marble and housing an Italian restaurant. Truly an odd, and oddly appealing, destination. One island further on, you’ll come to Omishima. The island featured prominently in Donald Richie’s travel classic The Inland Sea, written at the end of the 1960s, long before the arrival of the bridges. It’s a different place today, doubtless, but nevertheless is an officially designated National Place of Scenic Beauty. And the fantastic Oyamazumi Shrine still stands, with its astonishing collection of samurai arms and armor. In Richie’s day, these were housed in the open, in a dimly lit hall. Today, they’re preserved in museum that’s well worth a visit, if only to marvel at the child-sized suits of armor worn by some of Japan’s most legendary daimyo. If you have an interest in contemporary architecture, the island’s Toyo Ito Museum is a wonderful place to take a close look at some of the major movements within modern Japanese architecture. Though the claim may sound outrageous, this little island is one of the strangest places you’re likely to visit in Japan. Also called “Rabbit Island,” Okunoshima is in fact teeming with feral rabbits, most friendly and eager for a handout. Naturally enough, the island is enormously popular with daytripping families, many parents bearing ample supplies of carrots and cabbages to lure crowds of mangy bunnies to their delighted children. One of Japan’s official ‘kyukamura,’ or rest villages, Okunoshima has a hotel, onsen and other services, and virtually no permanent human population. This latter feature was no doubt one of the reasons the island was selected, in the 1920s, as a production site for chemical weapons. Until the end of the second world war, the island was erased from maps and locals sworn to secrecy as thousands of tons of chemical weapons, primarily mustard gas, were manufactured and stored on the island. A small museum does a credible job of covering this history, and a bicycle tour of the island will carry you past gas production sites, earlier gun emplacements and former storage facilities that still have signs warning visitors away. The juxtaposition of bunnies and mustard gas is unsettling, to say the least. And in fact, one explanation for the presence of the rabbits (there are several, but this is the best story by far) is that they are descended from rabbits used to test the efficacy of the poisons created here. Whatever the truth may be, Okunoshima is a fascinating place daytrip. We’ve barely scratched the surface here. With some 3,000 islands, and points of interest bearing on everything from medieval piracy to modern art, olive cultivation to the treatment of leprosy, the Inland Sea could keep a curious traveler occupied for years. So get out there and explore! From Hiroshima, Ikuchijima and Omishima are both reached by the Shimanami Kaido, which has its northern terminus in the wonderful little city of Onomichi. This can be done by car, bicycle, or even on foot. Okunoshima, or Rabbit Island, is most easily reached by a fifteen-minute ferry ride from the port town of Tadanoumi. You can either drive there in your own car (though you cannot bring your car on the ferry to Okunoshima), or take the train. If the latter, you’ll need to take the JR Kure Line from Hiroshima Station (or a Sanyo Line Kodama shinkansen to Mihara Station, transferring to the Kure Line from there) and getting off at Tadanoumi Station. The ferry terminal is a five minute walk south from the station, and the ferry itself departs about every half hour between 7:30 in the morning to 19:30 in the evening. Onomichi has long been one of my own family’s favorite day-trip destinations in Hiroshima prefecture. Time after time, this little port city continues to charm, from the slightly down-at-heel shopping arcade stretching along much of the waterfront to the wonderful maze of narrow passages that wind up and down the hill above the port. Famous for its cluster of 25 picturesque old temples, and the setting for a number of beloved Japanese films, Onomichi is worth a visit any season of the year. But if you can time your trip to coincide with a festival, well so much the better! And the Onomichi Minato (Port) Festival is one of the town’s largest and liveliest events. The Onomichi Minato Festival’s stated purpose is to celebrate the accomplishments of Kakuzaemon Hirayama, who in 1740 helped launch construction of the town’s modern harbor. On April 28 and 29, the Festival will celebrate its 75th year, and the planners appear to be pulling all the stops. A glance at the schedule of events over the festival’s two days shows food stalls (naturally, and in Onomichi you can expect better food than you’ll find at most festivals! ), taiko drumming, a mikoshi procession from Misode Tenmangu Shrine, a flea market, a yacht illumination, boat and hot air balloon rides and the festival’s centerpiece, the “E-Jan Sansa Gari dance contest. In this last event, groups of dancers compete against one another along the main seafront road. The main contest lasts four hours, from afternoon into early evening on the festival’s opening day, with “Grand Prix” awards conferred as night begins to fall. Additional children’s dance contests, as well as a maritime parade and harbor cruises, will take place on the second day of the festival. You can check the Festival’s website or Facebook page (listed below), but no matter what time you show up, there will be plenty to see and do. This is also a perfect festival to dip in and out of, combining it with an exploration of the rest of the town. Take the ropeway to the top of the hill and stroll back down along the “Literature Path” to the port past pagodas and temples, or step down an alleyway and duck into a cafe or shop for a short break. However you choose to “do” the festival, you’re sure to have a good time. Dates: April 28 and 29, a weekend. Scheduled events from 9:00-21:00 on Saturday, and 9:00-17:00 on Sunday. Location: Events throughout downtown Onomichi, but centered on the shopping arcade and waterfront road located a three minute walk east of Onomichi Station. For a more detailed map of individual events, see the map on the Festival website, listed below. Access from Hiroshima City: Far and away the easiest way to reach Onomichi from Hiroshima is by the JR Sanyo Main Line, from Hiroshima Station. The ride is about one and a half hours through beautiful coastal and mountain scenery, and brings you almost right into the heart of the festival. Onomichi Station is just a brisk three-minute walk from the shopping arcade and waterfront. For many people, spring really only means flowers, and plenty of them. Some of us can get all we need from a lazy afternoon or two under the cherry blossoms. But if that has only whetted your appetite for spring color after the long, bleak winter, then Hiroshima Prefecture’s Sera district has you covered. For years now, Sera (the name for both an area and its principal town, near the heart of Hiroshima prefecture) has been working to corner the market on Floral Tourism, and as far as western Japan goes, they have succeeded beyond all imagining. In and around the town of Sera, there are at least six flower parks, with seemingly more coming in every year, and by mid- to late April they should all be providing an absolutely glorious riot of color for visitors. From mid-April, Sera Kogen Farm is the scene of around 850,000 tulip blossoms, representing hundreds of varieties and a dazzling spectrum of color. Some of the tulips are planted to create large designs, and visitors are encouraged to stroll among the blossoms, taking photographs and luxuriating in the sheer profusion of flowers. Later, in August, the same area will be host to a sunflower festival, but in spring it’s all about tulips. Kamu no Sato Rokutan Park is blanketed in over 50,000 square meters of brilliant pink and white moss phlox, a ground-cover plant that creates dense mats of small, intensely colored blooms. Paths wind among the flowers, making you feel as if you were walking through a sea of pink. Sera Fuji-en Wisteria Park boasts well over 1,000 wisteria trees that, in spring bloom, create fragrant curtains of purple, violet, pink and white. The park’s own literature paints a portrait of crowds of women clad in beautiful kimono. You be the judge. And for those who haven’t yet had their fill of cherry blossoms, Sera Kouzan Fureai no Sato has a road lined with weeping cherries, inviting visitors to stroll among the hanging strands of delicate white and pink blooms. Of course, as with any tourist destination, there are other things to see, buy, taste and do. Small events are held almost daily in the various flower areas, and everyone in the family will find something to delight. So go take a look. The flower parks are spread out a fair bit, so this day trip is best made by car. From Hiroshima city, head for Hiroshima Airport and then continue past the airport into the countryside. The Sera District begins beyond the airport, and really, at this time of year you’re likely to find flowers nearly everywhere you look. Turns out I was just not looking in the right direction…err, language. If I had searched for 食品配達 (food products delivery) I would have seen there are a number of these services available, usually through the major supermarket operators themselves. The three biggest, Co-op, Ito-Yokado and Seiyu advertise this service all over the place but only in Japanese… but come on, in 2018, there’s gotta be one of these that does it in English, right? If you’ve read our restaurant delivery services article, you already know where we’re headed here. As of this writing, there are at least three apps and services that can be used to order food items from the supermarkets. Let’s start with the 900lb gorilla in the room, Amazon. Amazon Fresh is the section of Amazon’s online empire that handles groceries. Operating in many markets around the world, the Japan version offers same day delivery.to most of Greater Tokyo. The service is not ala carte however; you must have an Amazon Prime membership (¥3900/year), and there’s a ¥500 monthly fee for the Fresh service on top of that. This does not count the delivery fee which is normally about ¥500 yen or so. Ordering is straightforward and just like ordering a book, or a pair of shoes from Amazon. In the checkout section, you’ll be asked to reserve a time slot for your delivery as they will be sending a refrigerated truck to you with the items directly. Their service area as of now (March 2018) covers most of the 23 wards of Tokyo, Kawasaki and Yokohama in Kanagawa and perhaps even wider; you’ll know if you aren’t in their service area when you log in and your address doesn’t match up. HonestBee is a Singaporean startup that used its own country as a starting post before rolling out across Asia. They are already delivery groceries and other foods in places like Taipei, Hong Kong, and Kuala Lumpur. They act as a middleman between already established grocery chains and the customer. In this manner, you can use their website or app and shop from stores like Seiyu, Isetan, National Azabu, and more. Then they will send in their team of pickers to do the shopping for you and head over to your place with the goods in as little as an hour. They charge a ¥400 service fee and ¥400 delivery fee on top of what you’ve ordered; after ¥5000 yen worth of groceries that delivery fee is waived. For now, their service area seems to be the 23 wards of Tokyo and parts of Kawasaki and Yokohama east of the Daisan-Keihin Tollway. Many grocery stores also have same day delivery (当日配達サービス) for already paid-for groceries. This means you’ve already went to the market and done the shopping yourself and simply need a way to get it all home without involving a taxi. I’ve used this to snag items I know won’t be there (like certain fresh veggies) when I get off from work later in the evening, or when I have a set of errands to run and can’t be bothered hauling a bunch of bags all over Tokyo. You can select a delivery window later on in the day. Check at the service counter of your local store to see if they offer it; the vast majority will at the very least contract with a delivery service and get it to you. I know there are other services out there, so if you feel like letting the rest of the community in on your secret, drop a comment and let us know! It’s been almost eight years since the concept of bikesharing hit Japan’s shores in the Minato-Mirai and Kannai districts of Yokohama, but even though you can find some 87 different bikeshare organizations and companies operating in the country, most people here have no idea it exists; quite odd in a nation that spends a lot of time on two wheels, right? Luckily the concept is expanding in a major way across the Tokyo Metropolis at least, and we intend to give you the low-down on how to participate in the scheme. Bikesharing the concept of being able to rent a bike to go to a local destination in a short amount of time, picking up the cycle at a dock or port and dropping it off at a different location near your destination without needing to return it back to its point of origin. It solves the last mile problem for many people. In many cities in Japan it is very common to see throngs of cycling commuters in bedroom communities heading to their local train stations in the mornings. But what about when they get off at their destinations? Taxi? Bus? Walk? These are all options, but for some, bikesharing could make more sense. Depending on the actual company operating the bikeshare, you will need to preregister on a website, smartphone app, or on-site at a kiosk. By far the biggest player in the Metropolis is Docomo Cycle. They operate the bikeshare program in most of the central wards of Tokyo. On their website you can find their smartphone app links, instructions to use the service and of course registration area. You must have a credit card to register to the service and pay the fees. The cycles themselves have small computers that facilitate tracking and security functions; Docomo is Japan’s largest mobile network company and this is their technology at work. After you’re registered, simply log into the website, login, find the docking port nearest to you and choose the bike from the list. A passcode will show up to unlock the bike; enter this into the keypad over the rear wheel and off you go! Returning it is even easier; just park the bike at a dock in the system, lock it and press the Enter key and you’re done. I’ve personally used the bike share system to commute for work in the eastern part of Tokyo where train stations aren’t as dense, cutting a 20 minute walk down to less than 10. There was also that one time when my regular train went out of service due to an accident and I still needed to get to my office 4km away for a meeting. There’s currently 377 docking stations in the Metropolis so it also can be a really good way to tour around Tokyo and see a part of town you’ve never seen before. In fact if you visit certain hotel front desks in the system (accessible in the app and on the website), you can purchase a discounted 1 day pass just for this purpose. Images: Docomo Bikeshare bicycle in Tokyo. Jason L Gatewood, own work. The geisha is perhaps one of the most recognizable symbols of Japan, an icon that conjures up images of beauty, grace and a time of pre-industrial Japanese tradition. Perhaps the most famous geisha are the geiko of Kyoto (geisha translates as “person of the arts”, yet the geisha of Kyoto prefer the name geiko, “arts child”). Centralized within the geisha districts, most famously Gion, they perform for small groups of guests in ancient teahouses. Unfortunately most of us are unlikely to bear witness to these demonstrations of grace and cultivated beauty as, not only is a performance understandably expensive, admission is reliant on an introduction from an existing client. Perhaps the only way we are likely to see this ancient art on display is the geiko dances of Miyako Odori. While the seat Japanese power had shifted from Osaka to Edo (modern day Tokyo) following the rise of the Tokugawa Shogunate, the country’s official capital had remained the Imperial City, Kyoto. However, in 1869 this all changed following the Meiji Restoration with capital city status being transferred to Tokyo. As you could imagine, not only did this loss of stature rankle with Kyoto’s inhabitants, it caused something of a decline in the city’s revenue. To halt this slide and to showcase the art, culture and industry of the “ancient capital” the city established the Kyoto Exhibition in 1872. One of the most popular exhibitions proved to a the geiko performance (then affectionately referred to as the “Gion Kobu Dance”) in a grand, classically beautiful house named “Matsunoya” located in Gion. This dance was the forerunner of what is today known as Miyako Odori. Though often called The Cherry Blossom Dances in English, due to them taking place when Kyoto’s sakura are in bloom, Miyako Odori literally translates to Capital City Dances in English, reflecting the hope of late 19th century Kyotoans that their status would return. The dances themselves portray traditional Japanese scenes and are tightly choreographed. To ensure perfection the dances are slow in their elegance and refinement, meaning mistakes cannot be disguised by speed of movement. The geiko and maiko (the apprentices who start as young as 15, becoming fully fledged geiko around the age of 20) perform eight scenes that follow the seasons of the year, and are exquisitely made-up, clad in sumptuous costumes with the kimonos running to millions of yen. The showcase in 1872 was the first time that the nationally renowned and famously conservative geiko of Gion Kobu had performed in public, which naturally caused quite a stir. Due to this triumph the dances were repeated the following year and held in the more spacious Gion Kobu Kaburenjo Theatre where they continue to be held to this day. This year sees the 143rd presentation of the Miyako Odori, and tickets to the show are available now. Every day from April 1 to 31 the geiko and maiko of Gion Kobu will perform their exquisite dances, songs and short dramas four times a day, backed by a traditional Japanese orchestra. There are three sets of tickets available: second class bench seating on the third floor; first class seating; or a special class ticket that includes the best seats in the house. 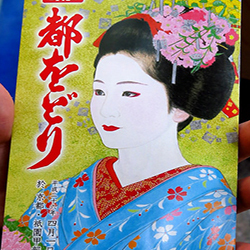 The special ticket also includes an opportunity to see a tea ceremony performance prior to the dances, a Japanese dango sweet, and a Miyako Odori dish to take home. The tea ceremony can be a little crowded, but considering the unlikelihood of being granted access to the famous teahouses of Gion, it is highly recommended.